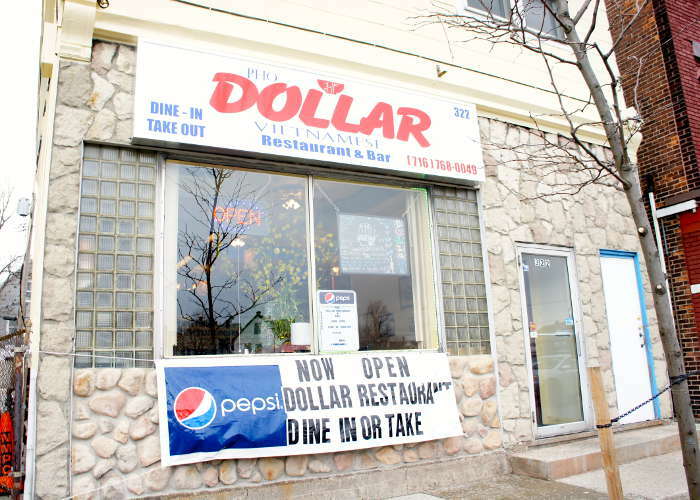 After hearing so many good things, I was psyched when the time came to review Pho Dollar. Let me just jump right in here. Vietnamese cuisine is everything I could want in a perfect lunch or dinner. I’ve been craving Pho Dollar for years without knowing it. 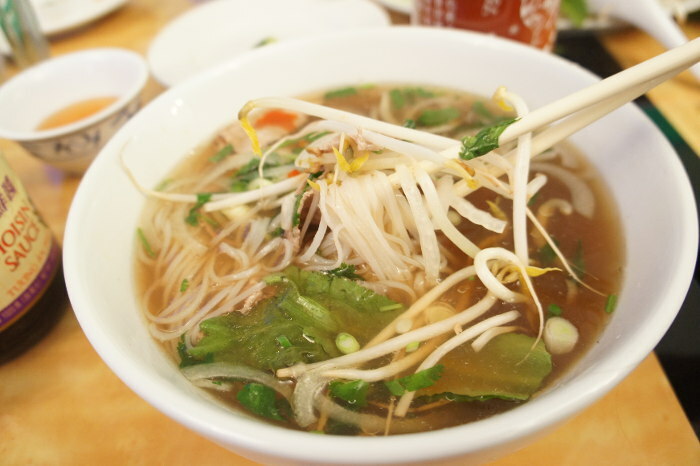 Eating pho has all the makings of an adventure. It’s messy, it’s confusing, it’s gleeful. 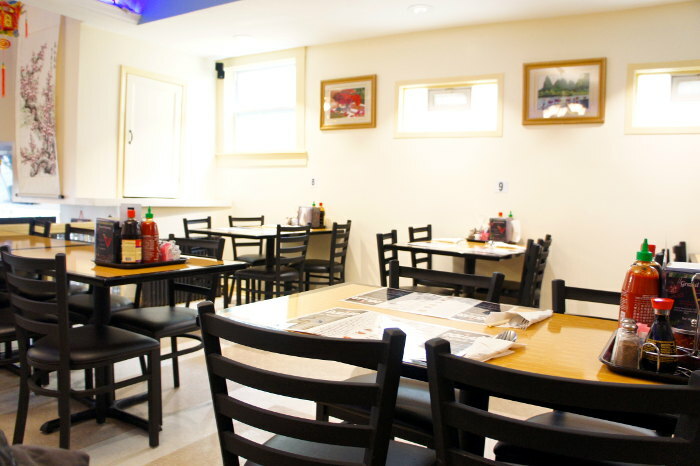 Pho Dollar’s menu is long and intimidating, but that’s what makes reading restaurant reviews so great. We can give you a starting point. But honestly, of the ethnic menus I’ve seen, this was one of the easiest to decipher and our waitress was so helpful and friendly, offering translations and answering any questions we had. Pictures are scattered around the menu and pointing to them, asking where they’re located on the menu led us to some delicious outcomes. (i.e. pancake) When the food came, our waitress was eager to show us the best ways to go forward. Which sauces are for which dish, what we should add to our pho, even demonstrating how to break up the extra shoots and herbs to add them to our bowls. Her efforts made a huge difference in our experience. 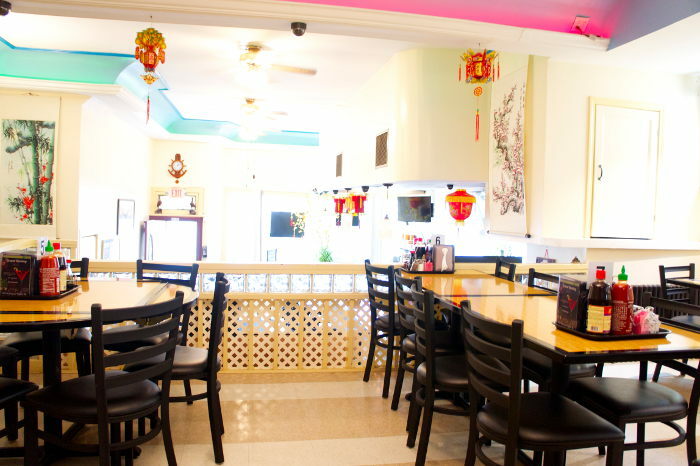 It puts diners at ease, makes them feel as if they are well seasoned in the art of ordering and eating Vietnamese food. Enjoying a new experience gives us all the more reason to come back. Not to mention what I would have been missing if I didn’t put Sriracha in my pho. 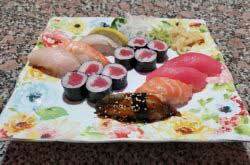 Full disclosure – we were very excited, and therefore ordered a hefty amount for three. Don’t feel like you need to order this much to fill up. 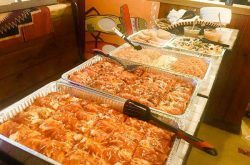 Dishes are served as they’re ready, sprawled across the table. 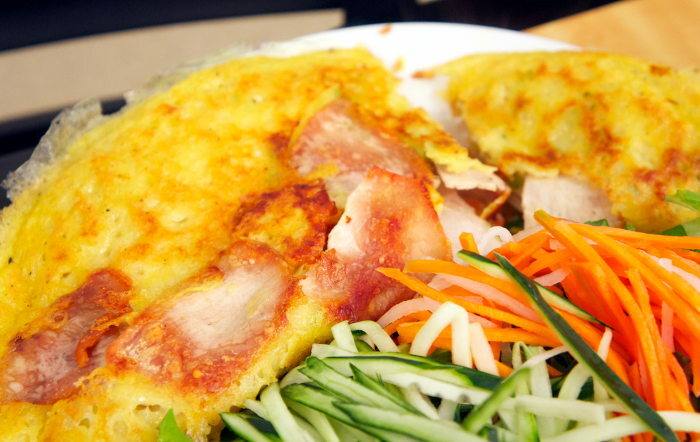 First we ordered #8 Banh Xeo ($9.95) – Vietnamese pancakes. This dish was absolutely delightful and unlike any “pancake” I’ve ever had. 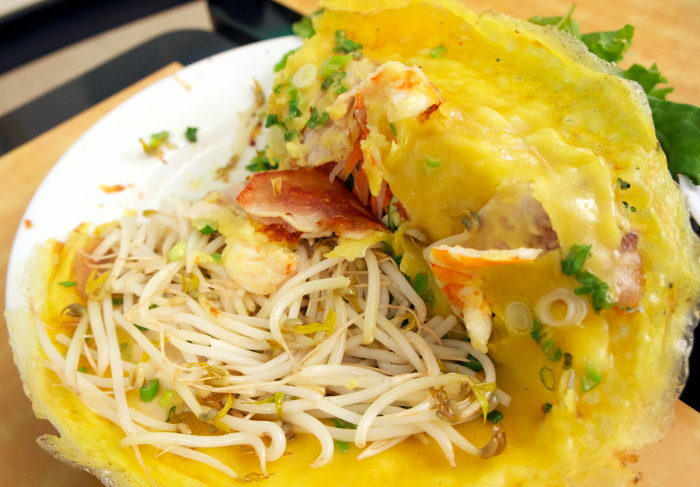 These savory fried pancakes made with rice batter are stuffed with bean sprouts, pork, prawns and shallots. 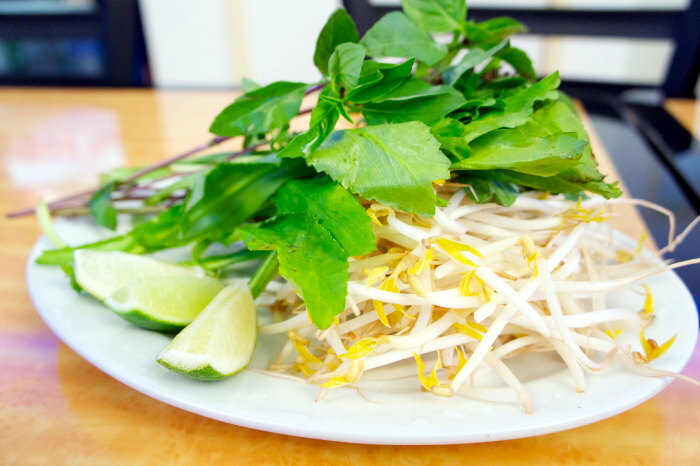 A side of more bean sprouts, cucumber and carrot strips and greens accompanied the fish sauce for dipping. The owner explained to us that they add some sugar and water to make the fish sauce a bit lighter than how it’s originally made. Their adjustments create a nice flavor, not too overpowering and extremely complimentary to the pancake. It will be hard to pick a favorite dish from this lunch, but the Banh Xeo was loved by all. It was a nice big portion, and somehow we longed for more. I one-hundred percent recommend you order this “sizzling cake”. 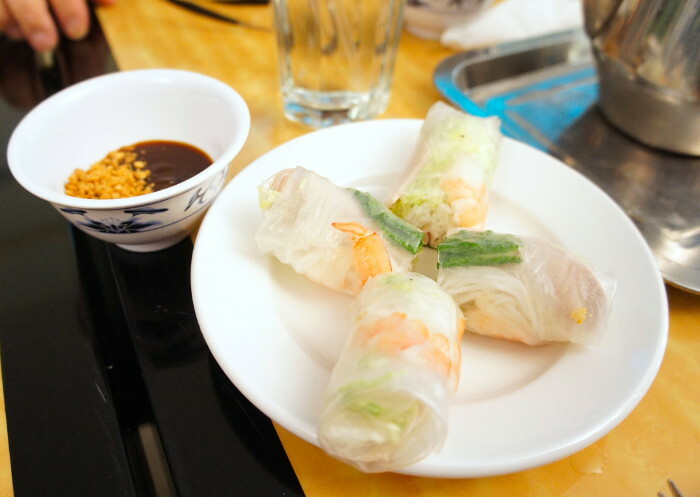 We also started with #4 Goi Cuon a Vietnamese summer roll made with pork or shrimp ($4.95), after hearing about them in other reviews. The rolls were interesting and came with both pork & shrimp inside. (I don’t think I specified one or the other and this was a nice surprise.) The pork was a little dry, leaving me a bit disappointed after hearing good things. Hoisin Sauce with chopped peanuts was served on the side. In comparison to the fresh rolls at Kaydara Noodle Bar, these left something to be desired. I wasn’t a huge fan of the sauce/roll pairing. 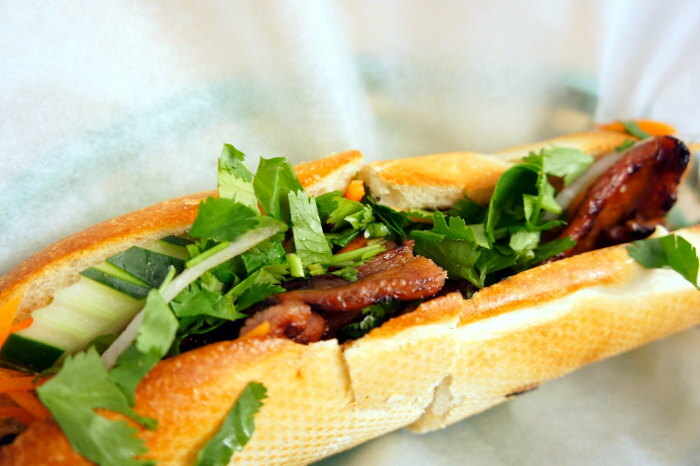 Next we ordered #16 Banh Mi Thit Heo Nuong ($4.75), a Vietnamese pork BBQ sandwich AND SO MUCH MORE. The bread was perfect with a crunchy outer layer and soft inviting insides, the pork was lightly tossed with barbecue and the vegetables that accompanied were crisp and if pickled, subtly. The cilantro was plentiful to my jubilation. To be perfectly honest, we were so consumed with inhaling it that I didn’t take much note on the sauces/pate that were present and delicious. It all combined to make a perfect sandwich in my opinion. Splitting one between two people is the worst idea. Learn from our mistakes. They are only $4.95! I should have ordered three to go! My dad ordered #35 Mi Bo Kho ($8.95), stir fried beef and carrots with egg noodles, in broth and served as a noodle soup. Big hunks of beef were an eye catcher, surrounded by onions and cilantro, egg noodles sitting on the bottom. 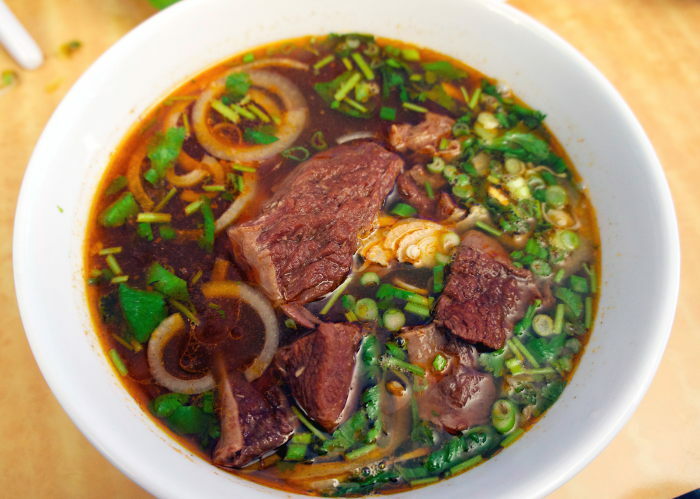 This broth was thicker and also delicious with a meaty flavor to it. My uncle asked our waitress to reveal her favorite pho dish and she recommended #22 Pho Dac Biet ($8.95), a bowl of special beef noodle soup. As you can see in the photo above, there were at least two kinds of beef involved, herbs, vegetables and rice noodles (I believe). It was good, the broth lighter than the Mi Bo Kho. Please note that while trying my best to describe the full picture of the ingredients in these dishes, I could absolutely be wrong. What I can tell you for sure, is that all of the Pho tasted great and the unique combinations of flavor were lovely. Inside Pho Dollar is a long bar and stairs leading to a loft with tables overlooking the lower level. 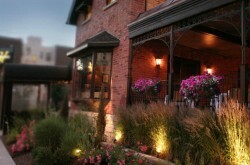 They did a major renovation, very nice on the inside, and hopefully it will pay off. Updates to this gem don’t end there. 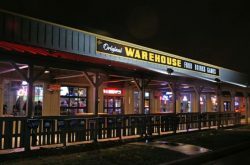 The owner, a helpful and enthusiastic man, told us they were working on getting new menus printed (minus typos) and that they had just received their liquor license that day. The bottom line? 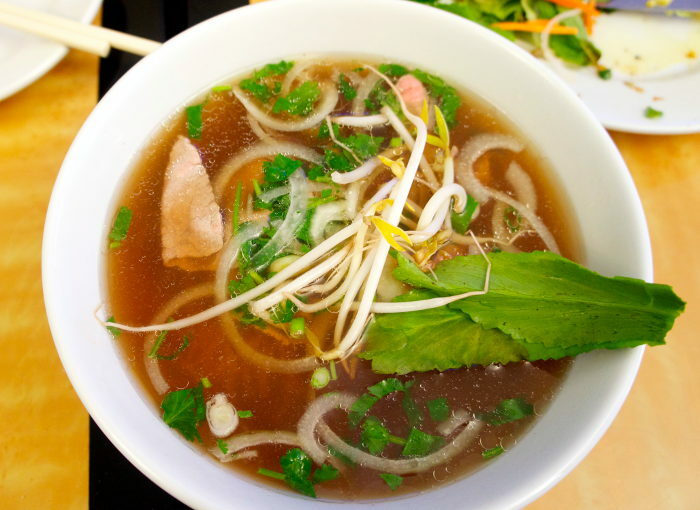 Pho Dollar is serving excellent food that you need to try. I wanted to take some home. I wanted to go back the next day. I have been constantly craving Pho Dollar for the past week.